We're really excited about the new Travis Bean guitars. The quality and finish are superb, sustain is unbelieveable and they play like a dream. Travis Beans Designs has taked a long time to release these guitars. In 1997, Travis and Rita Bean planned to produce a partial reissue of the original Travis Bean line. The intention was to have the new aluminum guitars feature a metal neck and wooden fretboard however they incorporated a hollow pan at the rear of the body which was machined from the same billet as the neck. There were around 18 of these prototyped but financing fell through before full production and unfornately Travis Bean passed away in 2011. Rita Bean and Kevin Burkett of Electrical Guitar Company hatched the idea that the 1997 run should be revisited. Kevin is a huge fan of the prototypes built in 1997, owning 4 at one point. Keven owns Electrical Guitar Company so he's an expert designing and building aluminum guitars. Kevin tweaked the 1997 design and incorporated different elements of all the past Beans. Prototypes were sent to Rita to be reviewed by Travis’s best friend Marc McElwee. Marc had been friend and business partner in the original 1970s Travis Bean Guitars. Marc signed off on them and has been very enthusiastic about the new Travis Beans. Kevin and Rita started Travis Bean Designs to provide Travis's final design an opportunity to be appreciated by guitar players world wide. These are truely amazing aluminum guitars and we've hard time keeping them in stock. 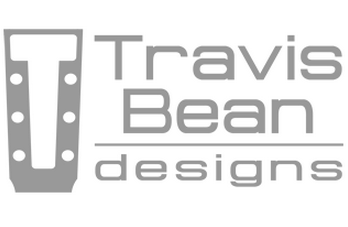 We're an authorized Travis Bean Designs dealer. We try to keep several on hand and we can order anything Travis Bean Designs offers. Please contact us to discuss buying a Travis Bean Designs guitar.